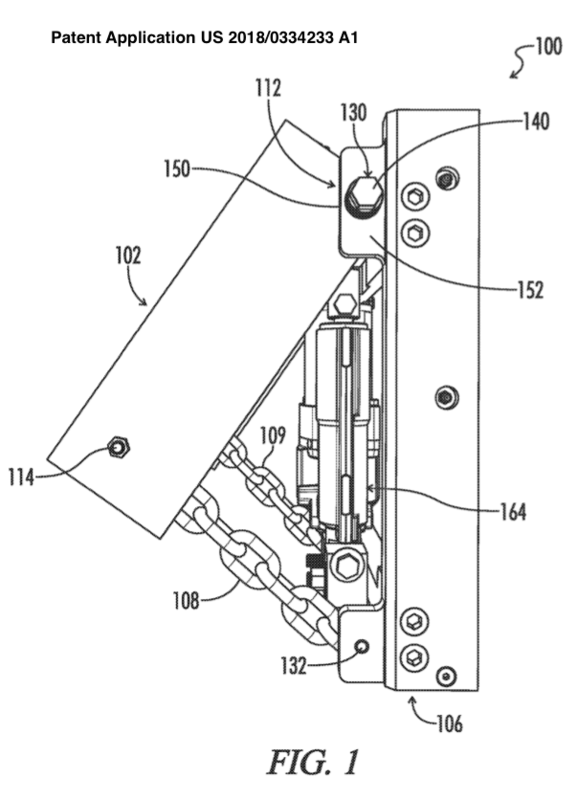 David Vance Jr. filed a patent application for a jack plate integrated with a kickup bracket. The kickup portion of the assembly is chained to prevent over rotation of the outboard when a submerged object is struck. The patent application was published 22 November 2018. Mr. Vance, the inventor, says this design is for faster vessels and shows a hydraulic jack plate integrated with a kickup bracket as seen in Figure 1 below. The chains basically act as a tether. The patent application refers to the chain (item #108)as a “limiting strap”. Item #140 in the images above is the tensioner that allows the jack plate to kickup (swing out and upward) on impact. 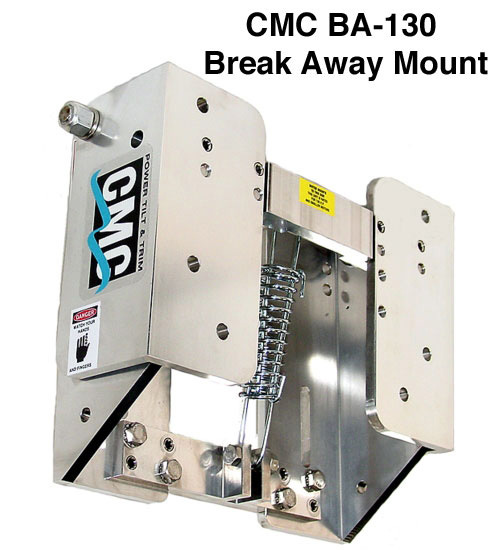 CMC is one of several firms currently building kickup brackets for small outboards. Some CMC units include chains to prevent them from totally breaking free of the transom if they strike something fast enough to fail the bracket. As we understand it, Mr. Vance has invented a bracket of this nature that can be integrated with a manual or hydraulic jack plate targeting applications with larger motors and faster speeds. At first thought, it sounds like an approach that could lengthen the time of contact during strikes of a submerged objects by bass boat outboard motors which would reduce peak loads. The patent itself is a little confusing about its target market. The patent states it is for faster boats, then says for those in excess of 10 miles per hour. No mention is made of the hydraulic log strike system on large outboard motors or of any interaction between this invention and those systems. Tiller steering is mentioned at least once in the patent. Thats leads us to speculate they are targeting smaller, but not very small outboards. Such as maybe 25 to 50 horsepower? We do not recall ever seeing “factory” jackplates on outboards that small, perhaps due to the cost of hydraulic jack plates and to the challenges of bolting smaller outboards to the transom vs. clamping them to the transom? If in fact the inventor is talking about bass boat outboards, an application where jack plates are frequently used, bass boats already have hydraulic log strike systems. Plus if you added additional trim to the unit by allowing it to kickup, you might smash their large cowl against the rear deck due to minimal clearance already. 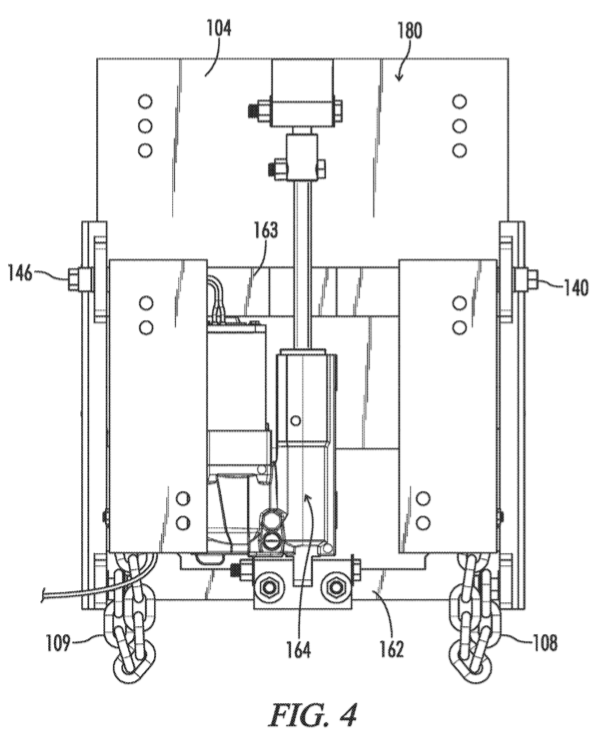 We look forward to learning a more about the inventor’s actual intentions if the patent is issued and are happy to see another concept added to those than can prevent outboard motors from breaking off and flipping into the boat.